6 foot 8-pin Lightning Male to Female Extension Cable for iPhone / iPad / iPad Pro / Music Docks Lightning Extension Cable (6 foot, white & Black) for iPhone Xs / iPhone XS Max / iPhone SE, iPad Pro, iPad Air, iPad Mini and all Lightning Accessories; Pass Video, Data, Audio Through Male to Female 8-pin Cable [AP004978] - $11.95 : allputer.com - Accessories for all your Portable Electronics & Computers! 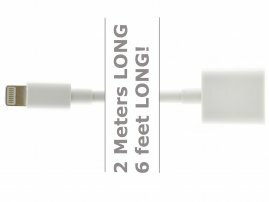 This 2 meter long male to female Lightning extension cable is compatible with all new Lightning-equipped iPad, iPhone and iPod models. It is designed to give you extra reach when you need it, let you keep your case on while you connect to a variety of accessories, and keep your device in your hand when connected to speaker docks or other audio systems. You can now get the extra length you need, and don't ever take your case off again! It supports audio/video transfer, and smoothly connect your Apple device and HDTV via HDMI adapter, allows you to dock your iDevices from a distance, provides connection pathways for power audio output USB data sync play controls accessory power and composite video. It is a full functionality extension cable for new iPhones (iPhone 5 and later), iPads (Mini / Retina & later), & iPods. - You can use it to charge your iPhone / iPad Pro / iPad Air / iPod Mini / iPod Touch / iPod Nano, listen to music, watch movie and transfer data, sync via other function cable. - FULL FUNCTION: The Extender Cable allows you to dock your iDevices from a distance, provides connection pathways for power audio output USB data sync play controls accessory power and composite video. It does not support S-video output or input for recording audio. - It does not support S-video output or input for recording audio.